It's time to really start the World Cup warm-up show. Adidas have launched a brand new Copa Mundial Samba Pack, where the iconic football boot has gotten no less than five brand new and different colours. We crank up the samba rhythms and take a closer look at the new World Cup guests right here. If you wanna do something, you better do it properly! This seems to have been the point of departure for Adidas in connection with the new colourways for the Adidas Copa Mundial. Why only make one new colourway, when you can make two? And why just make four when you can do five? The Adidas Copa Mundial is not known as a football boot that is constantly unveiled in numerous new colourways. 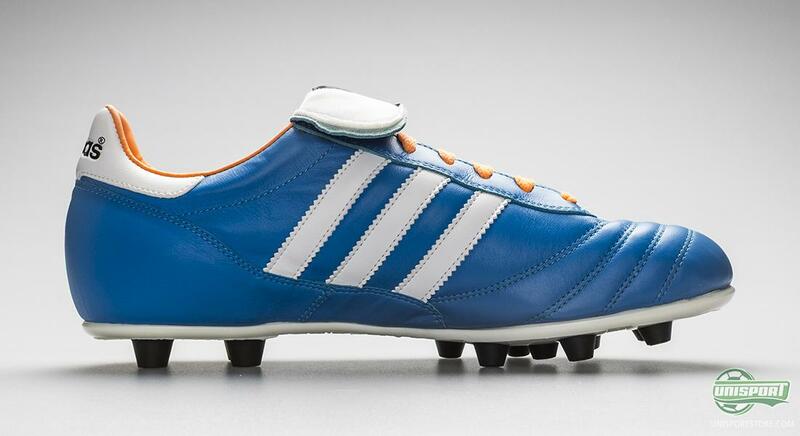 Actually the white colourway that we saw last year, was the very first colour update in the boots long and glorious history. 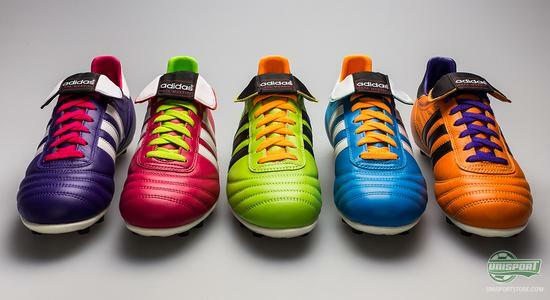 Now the boot gets no less than five brand new colour updates on top. 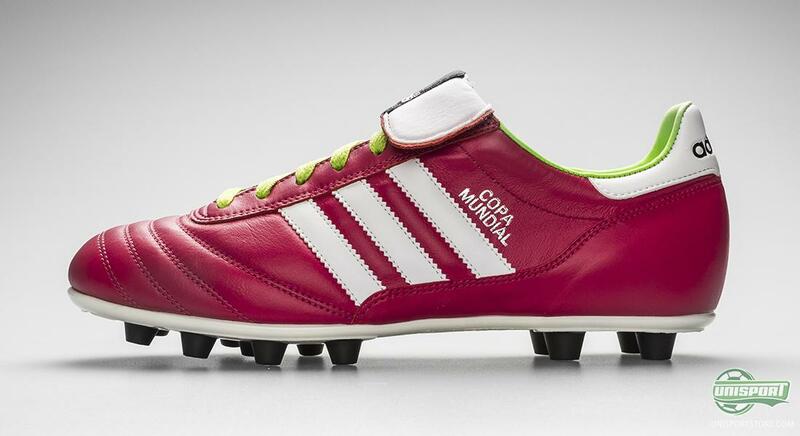 Would you like to get your hands on the new Adidas Copa Mundial in one of the new colours, then you can see much more right here  price 180. 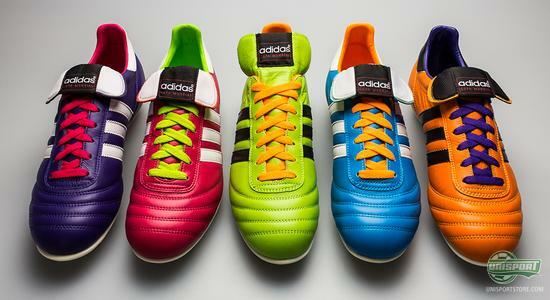 The Copa Mundial is, with the Samba colours, more than ready for a lot of samba play, and if you feel like you have seen the colours before. Well, then you're not too far off. 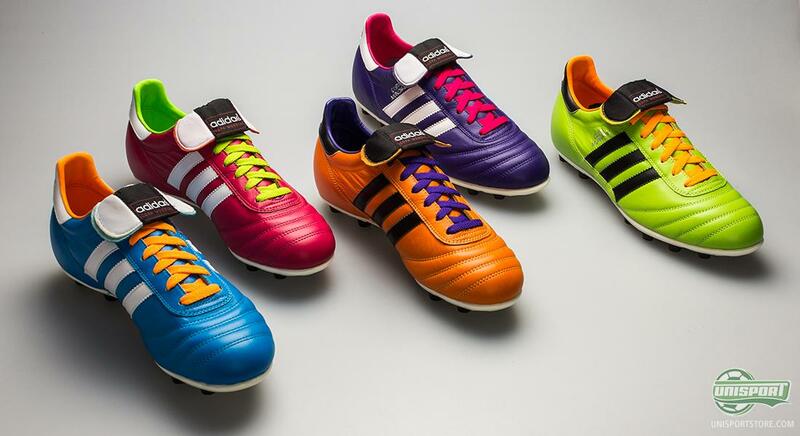 If you take a look at the colours, they are actually the same as those found on the Adidas Samba Pack, which was launched in November, last year, and which were also a part of the big World Cup warm-up. 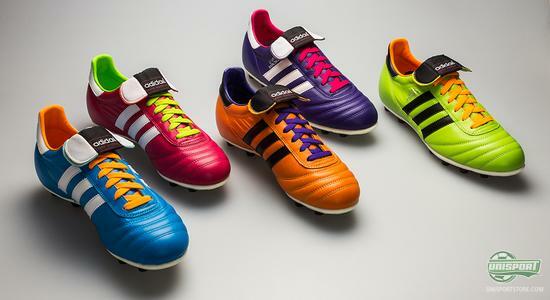 The blast purple colour from the Adidas Adipure 11pro II, the solar blue and solar zest colour from the Adidas F50 Adizero, the vivid berry colour from the Adidas Predator LZ II and then solar slime from the Adidas Nitrocharge 1.0 have all been inherited by the iconic Adidas Copa Mundial. 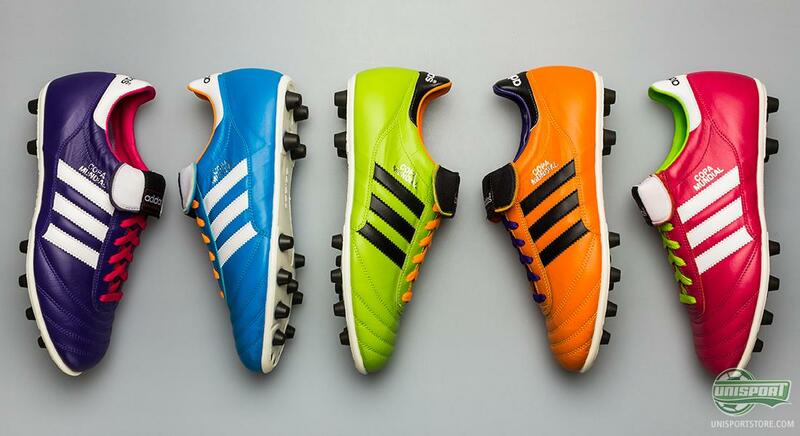 If we take a look at the football boots one by one, they vary quite a lot, although they are all born with the same and thoroughly tested technology, which has made the Adidas Copa Mundial a true icon. 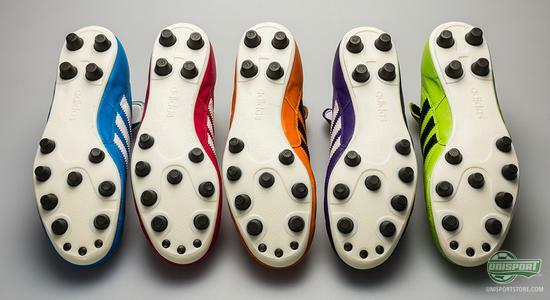 The new Copa Mundial each have their own special unique expression, so if you enjoy displaying your personality through your football boots, then you will have plenty of options. 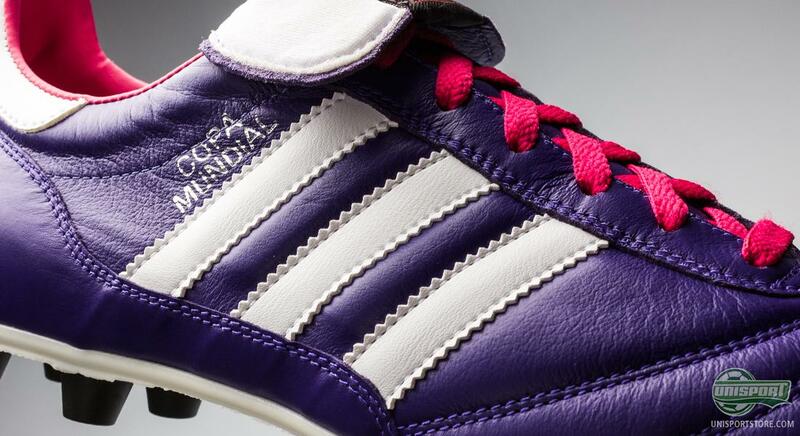 The blast purple Adidas Copa Mundial comes off as elegant and has a darker look, which is then combined with something fresh and youthful. 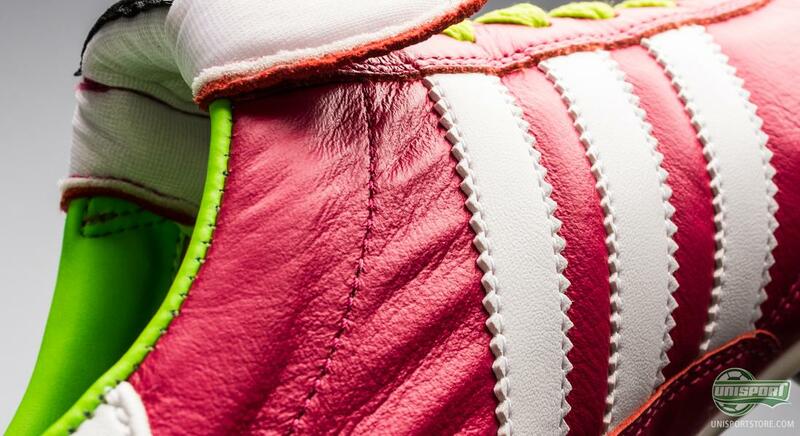 It's got vivid berry coloured lacing, just as the insole has also gotten the vivid berry paint job. This combination of blast purple, vivid berry and of course white gives the boot a unique look. 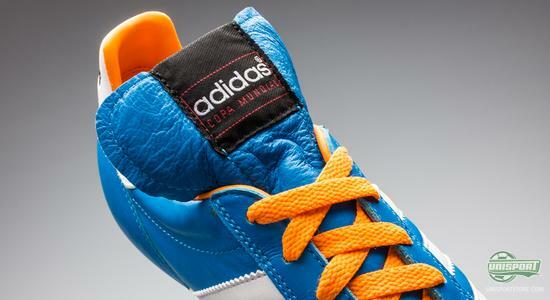 The solar blue Adidas Copa Mundial is fresh and modern. The solar blue colour is complemented by the solar zest colour, which we know from the Adidas F50 Adizero. And after having seen that exact boot in action on numerous occasions, we are not late to establish that the colour combination is spot on. The Adidas Copa Mundial Solar Slime fits right in with the attention demanding football boots. 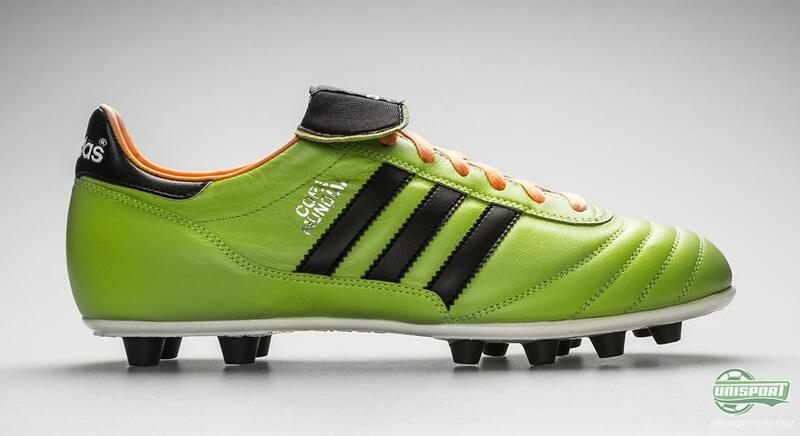 You can hardly miss the sharp solar slime colour with the black Adidas stripes and a black tongue, the Germans have created an interesting contrast that really makes the boot stand out. The insole and lacing has been given solar zest treatment and provides lots of energy to the boot. 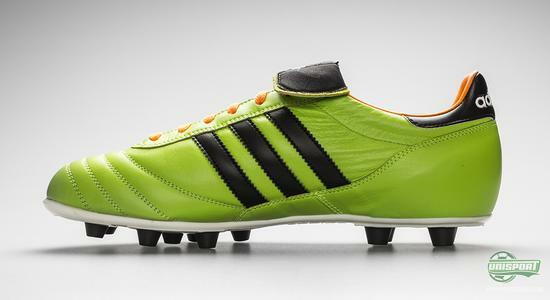 The solar zest colour on the Adidas Copa Mundial is also hard to miss. There is a reason why a lot of traffic signs are orange, and the Adidas interpretation, solar zest, is definitely something that catches the eye. 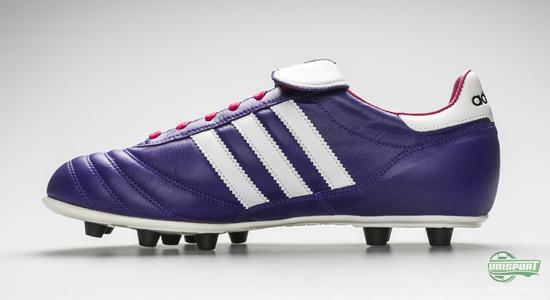 The football boot also comes with black Adidas stripes, while the lacing and insole have gotten the blast purple paint job. 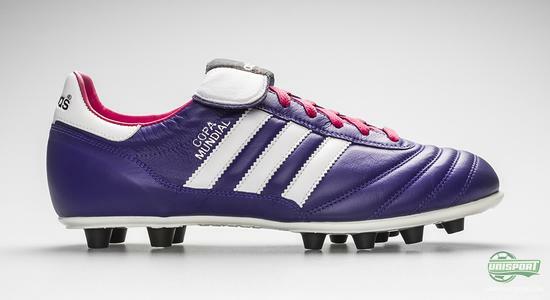 The Adidas Copa Mundial vivid berry is a football boot full of life and colour. It takes a lot of courage and confidence to jump into a pair a pink boots, but if you have what it takes, you may just end of being the hero of the day. 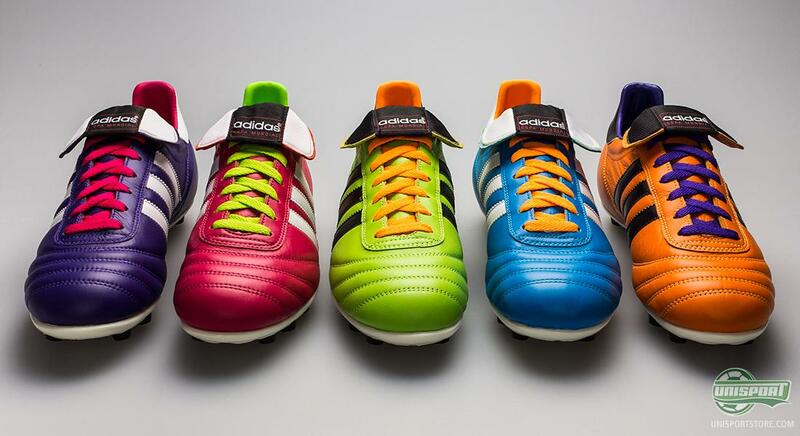 The new Samba version comes with white Adidas stripes, while the insole and laces have gotten the sharp solar slime colour, which is also quite sure to attract some attention, if you find a a little dull with 'just' the vivid berry colour. If you're a fan of the iconic Adidas Copa Mundial collection, it may seem a little overwhelming to get no less than five new colourways at once. Especially when they are this crazy. On the other hand, there is no reason to fear that the old and classic virtues of the Copa Mundial are lost. The football boot has not been changed one bit, it is just the colours that are different. 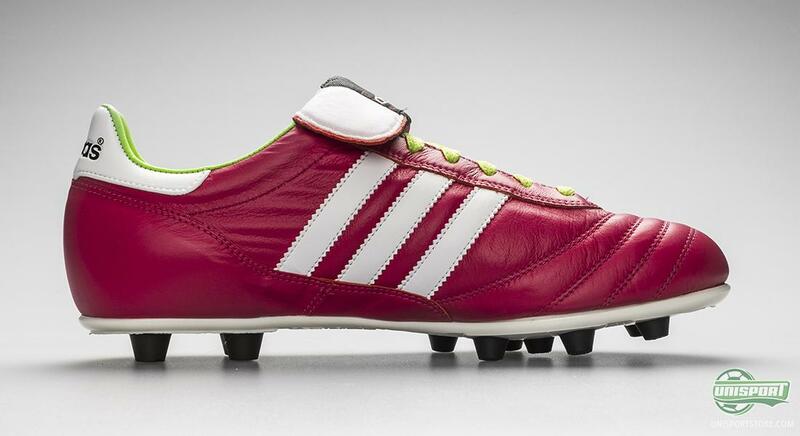 The upper on the Adidas Copa Mundial consists of lush kangaroo leather, which provides a snug fit and gives a very supple and comfortable feel. The leather will stretch and adapt to your foot, which results in a boot that is shaped in accordance with your foot already after a couple of trips to the pitch. The lush kangaroo leather is not only good in relation to comfort. It also feels nice on the ball and provides a sublime touch. When some people refuse to wear football boots that are made of anything else than natural leather uppers, it may very well be due to the Copa Mundial. 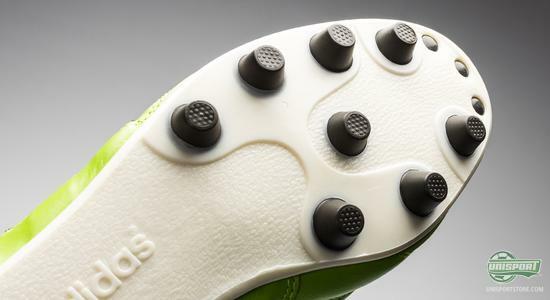 It is definitely already well established that this upper is designed to caress the ball. 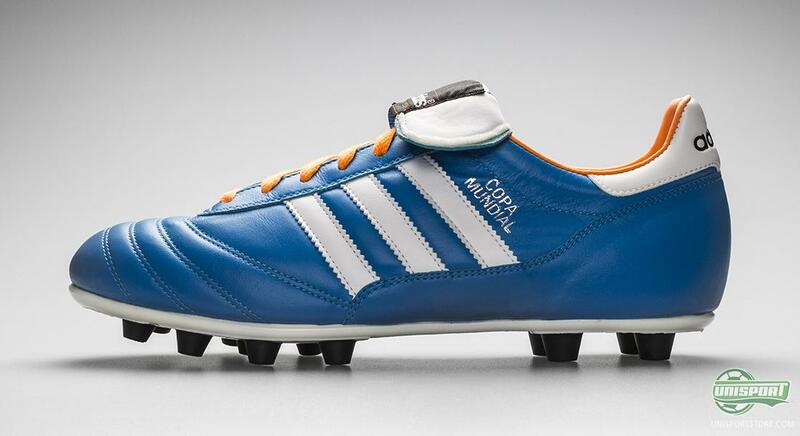 Comfort is clearly a keyword in connection with the Copa Mundial, and there truly is no one out there who can claim that they find the Copa Mundial uncomfortable to wear. One of the secrets behind the good comfort is the technologically developed EVA insole, which gives great shock absorption and adapts to your foot. 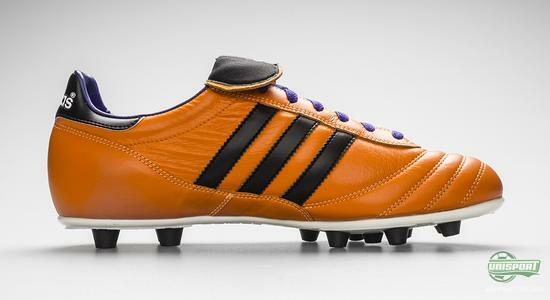 This paired with the ace kangaroo leather it is the recipe for a boot that is rivalled by none in terms of comfort. Adidas have launched a whopping five new colourways of the iconic and classic Adidas Copa Mundial. What do you think about the new models? And which colourway is your favourite? We would love to hear from you in the comment-section down below, or on Facebook and Twitter.